One of my favorite ways to enjoy huckleberries is in barbecue sauce. If you have never had Huckleberry BBQ sauce, you are missing a wonderful combination of sweet and savory sauces for beef, pork or chicken. First time I had huckleberry barbecue sauce was in a meatball dish. The gal cooked the meatballs ahead of time; then added them with a bottle of sauce into a crockpot and cooked it awhile longer. Oh my goodness, it was delicious! Most Huckleberry BBQ Sauces make great dipping sauces for chips, veggies or meat strips; as a marinade sauce (or with meatballs! ); in baked beans or lentils; on your homemade pizzas; as a spread for your cold meat sandwiches; mixed in your specialty salads; in soup or stew or chili …. and I have mixed huckleberry barbecue sauce into vegetables as a sweet sour style flavor. Several different Huckleberry Barbecue sauces are produced around the Rocky Mountain region — where most huckleberries are harvested. Gem Berry’s Huckleberry BBQ Sauce: Made in the Sandpoint, Idaho area, this is my very favorite sauce (and the one used in the meatball dish described above). This thick style sauce is very flavorful with a mix of tomato sauces, pastes and purees along with huckleberries, blueberries, brown sugar, vinegar, onion and spices. Dorothy’s Wild Huckleberry BBQ Sauce Marinade: A thinner sauce, made in the Boise, Idaho area, is great for marinading your meats and fish before you cook. This sauce contains many of the same ingredients along with chile and onion powder, paprika, molasses and grilling flavor. Huckleberry Haven Huckleberry BBQ Sauce from our friends, over the border in Montana. I know that huckleberry season is over and because of the heat and fires, the 2015 season was not a good year for huckleberries. But that does not mean you can’t enjoy your favorite huckleberry gourmet foods and treats! 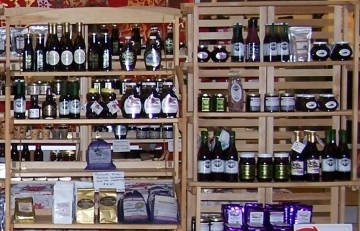 Our sister site, Tastes of Idaho, is filled with huckleberry products! And we are not just talking about jams and syrup, but we have loads of other fun huckleberry products such as …. …. and oodles and oodles of huckleberry products!! Check out our entire selection of huckleberry products! he dozens of huckleberry products, pick out a basket (several to chose from) and shred (8 color options), and have it shipped to anyone on your Christmas list. We include a finished basket, shrink wrapped with a card and bow and shipped to anyone in the US! Check out the Build Your Own Huckleberry Basket option! Make this a memorable Huckleberry Christmas! Looking for a new unique huckleberry dish to create NOW, before huckleberry season? Our huckleberry vinegar, featured on our Tastes of Idaho website, has many delicious purposes, other than use in salads, in cooking your favorite sweet and sour dish. Mix ingredients together and use. You can find Wildbeary Huckleberry Vinegar on our Tastes of Idaho website. Enjoy your huckleberry sweet and sour sauce! How about surprising your family and friends, with something to try out on the barbie grill? At Tastes of Idaho, we carry the ORIGINAL (and still the best) huckleberry BBQ sauce from Gem Berry Products. A beefy 16 oz bottle, that pours well, and is great on salmon, chicken, pork, beef or wild game! A slightly sweet, savory sauce with bits of REAL huckleberry dotted about. d hand-made in small batches to enhance the natural flavor of this wild mountain fruit. Labeled attractively in 16 oz. glass bottles, this BBQ sauce has the ambiance of a sweet and sour tomato based sauce that, in my opinion, is to die for!! First time I tasted it was in a meatball dish and it was heavenly! 129 mySQL queries in 0.228 seconds.